When we moved into our house 25 years ago - a quarter of a century, crikey - we had a blazing red and orange carpet to compensate for dark nights or days of low cloud. The current cold (but to be honest, bright) weather has brought a sudden glory of Red-green Carpets, albeit of the mothy rather than textile kind. There were seven beautifully fresh examples in the trap this morning, much to my particular joy because in the all-but-total absence of blue from the UK moth colour palette, my favourite colour is green. Here are some pictures of four of them. I find it interesting how either green or 'red' - actually more a russety brown - predominates depending on how you look at them - eg in the first two photos which are of the same moth. Do you remember those 'magic pictures' for children (of all ages) which played that trick, showing two different subjects, each predominantly made up of a different colour or very similar tones? The mother rules in the Red-green Carpet family, surviving the winter by hibernating in a way which males do not. Hardy creatures! And they are getting practice at the moment on very cold nights. Look, the one below which was on the canopy rather than in the trap, actually has dew droplets on its wings. 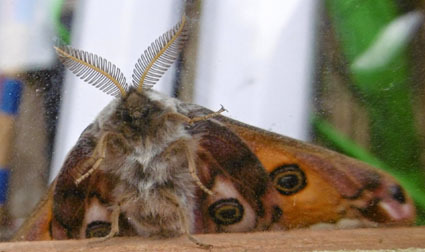 Their life cycle might form a nice allegory for feminist writers: a moth which goes to sleep when the men are around as usual but wakes to find that she's in an all girl's world - until her eggs hatch and her briefly peaceful idyll is shattered. Sorry, I have been a bit inert in the moths department on account of busy-ness and dodgy weather. But the rest of the natural world has carried on as normal. Red in tooth and claw, they say, which is true. It is also true that an animal's life is hazardous and usually short. I hope that this bat which came down our chimney survives. It somehow avoided the gas fire and crash-landed on the hearth. We gingerly scooped it up in a pond net, to its annoyance, and took it outside on which it flew off, although not altogether normally. Last time we found ourselves in charge of a bat was many years ago. We rang the local bat hospital in Otley, whose staff came round and spent all evening with us, only leaving when they detected a passing bat of the same species and released the one which had flown into one of our boys' bedrooms. I think they liked Penny's tea and ginger cake. There was no doubt about the fate of this thrush, sadly. It flew into a window pane and that was it. I reckon we lose about half a dozen birds a year in this way - by far the most spectacular being a sparrowhawk which hit our sitting room window in July 2009 with such a thump that its claws, legs and part of its body left a ghostly outline on the glass. You can read about that here. Isn't the thrush's plumage lovely? What a sad waste. The mornings are getting darker, and so are the moths. 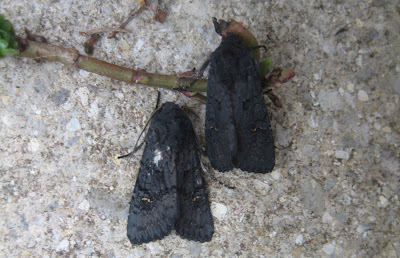 The year's first Black Crescents arrived last night, twin Darth Vaders with a little corps of wasps to serve as their Imperial Stormtroopers. Mind you, they were all so sleepy that Luke Skywalker and Princess Leia could have locked them up without their ever knowing. Appearance isn't everything - and actually, don't you think that their tiny wing-crescents of glittering gold are a sign that they're not really from the dark side? One of them posed without protest for me to photograph its underwing, above. And here below is another Star Warsy character, although it's only a Silver Underwing (sorry, I meant Silver Y - see Comments) seen from an unusual angle. I mustn't go on and on about many moths resembling jet planes, but this is definitely another which does. How do you greet the morning, especially on Saturday which is often the modern day of rest? Bleary or perky? My moths are usually in the first category, or an even sleepier one called 'comatose', but not all of them. Those with slenderer bodies often seem to be jittery and ready to flutter away by the time I get to inspect them, especially in the summer when the dawn comes so much earlier. Curiously, in my family, the opposite applies: I am always up early while my slender companion in life dozes on. Here are two morning trap arrivals, ready for take-off: a plume moth, whose curious T-shape always fills me with great satisfaction; and a Mother of Pearl, another species whose praises - that wonderful iridescence! - I never tire of singing. Colder weather and the return of overnight drizzle didn't make for much of a catch in the trap this morning, but among the seven slumberers was this distinctive moth. It's an Angle Shades, whose rakish wing shape is perhaps the most dramatic of all UK species. I wonder if one has ever been filmed in flight, to see if the structure gives the moth advantages. Maybe it swoops more elegantly than the average British moth's hectic, late-for-the-train style of dash. The wing shape can distract you from the beautiful pattern and subtle colouring, even including a trace of my favourite but very rare mothy colour, blue. Here it is closer-up, a view which also reveals a tiny, piggy-backing fly. Here's a Green Carpet on a mauve cushion, a textile composition in Suffragette colours, almost. Give Women Votes - Green, White, Violet. And yet here am I, not even knowing whether this moth is male or female. You have to examine their genitalia to ascertain that and this involves either killing or freezing or temporarily anaesthetising them, none of which I wish to do. 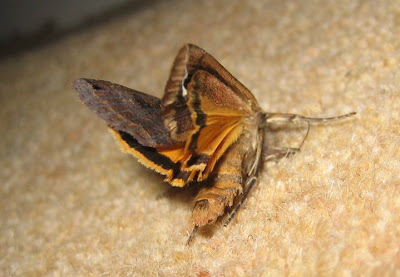 What a pretty moth, however, in spite of its small size. There were several of them in the trap last night. 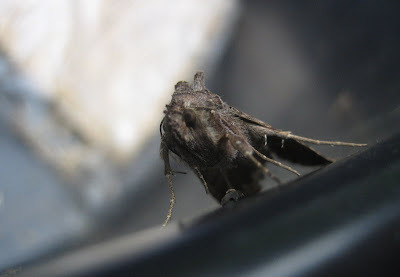 Here it is again, just to illustrate the problems of moth photography, even with today's brilliant digital cameras such as my Canon Ixus. As the nights draw in and the mornings darken, the task gets that bit harder. Pictures are generally far better without flash, but we are running out of light. Finally, I should have mentioned in yesterday's post that the caterpillar of the Centre-barred Sallow has interesting habits. It starts life in the bud of an ash leaf, contentedly eating its home in the manner of many moth larvae. When too big for this, and after the remains of the bud have uncurled, it finds a nook low down the tree in the bark and then, at dusk, nips up to feed on the nearest leaves - climbing very quickly, according to my Moth Bible. I would like to witness this. Here is its close relative the Orange Sallow, which visited last night (and also illustrates the difficulties of photography without flash inside the bowl whose black plastic seems dark to the eye but emits strange background light to the camera). Orange Sallow caterpillars also race up trees but start life as an egg on a twig before spinning leaves together and hiding in them when young. I routinely slag off the various sorts of 'yellow underwing' here, for the specious reason that they are so common. At times, indeed, the trap is almost overwhelmed by them - over 100 on occasion - so that their individual beauty gets forgotten amid exhaustion at the sheer number and the possibility that they may dull my senses to something smaller and rarer. Their other disadvantage is that, when at rest, they very seldom show the vivid underwings which give them their name. I have managed to photograph and post a few glimpses over the years; and there was one rather dramatic image of a moth disappearing into a blackbird's beak. 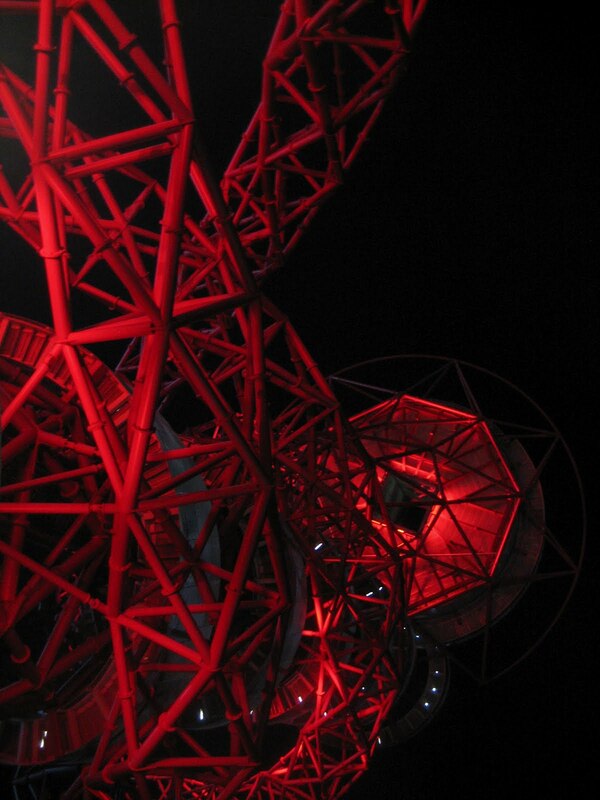 But here, above, is one which allowed me to get a closer look, albeit largely from behind. It couldn't object, because it was dead. I couldn't re-arrange its wings because it must have perished when we were at the Paralympics in London and it had gone stiff, as in the American nickname for a corpse. When I was a boy collector, I used to get some sweet-smelling stuff called 'relaxing fluid' from our local chemist (who also supplied me with 'killing fluid', no questions asked). This softened the muscles and allowed you to 'set' the specimen; but those days have gone. I've been down in Olympiclandia in London having a truly amazing week at the Paralympic Games whose marvels have been much-described, and rightly so. Among the many delights of the park (which is very big, taking a good half-hour to cross from side to side) is the wildflower planting which is extremely beautiful. 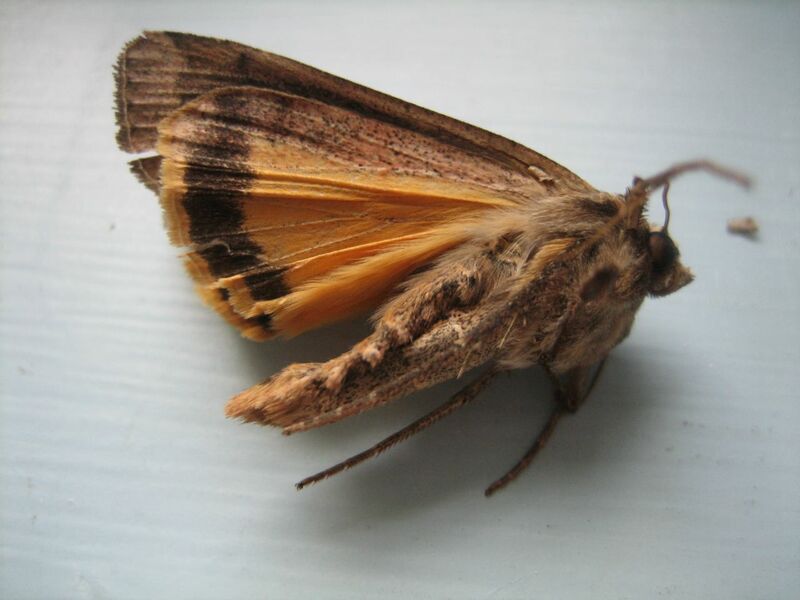 It has also been done with an eye to attracting wildlife, including the Brocade moth. How excellent that such a vast project should take account of such a small creature, and see the value in publicising this too. I didn't see any Brocade moths and wouldn't have recognised them if I had done - my Moth Bibles being in Leeds - but there were masses of these Common Blue butterflies, above, skittering about in the wetlands area beside the river Lea. Penny's vivid clothing also attracted this ladybird, which we consider to be a sign of good luck in our family. And we finished up a great spell, including three bronze medals in swimming for our older son and daughter-in-law's bridesmaid Susi 'Suse Missile' Rodgers, by clambering up the most famous 'animals' in the park - the squid and octopus whose writhings make up Anish Kapoor's Orbit tower.